At the moment, the SiteW team is working particularly on improving their design tools to build a website. Indeed, we want you to have the most customization options possible, while keeping our tools simple, intuitive and handy. So that you can easily design your own web page the way you want. This month, we offer you a brand new Parallax feature that you can use for your images and sliders. Parallax consists in making the image scroll slower than the rest of the website in order to create a stunning 3D effect. This feature was already accessible for your website backgrounds. You can now use it for all your images and sliders. Go to our Demo websites to see all the Parallax possibilities. How can I enable the Parallax feature? Please note that the 3D effect will be more impressive if you have selected the Full width screen option for your image or slider. How should I use the Parallax effect on my website? You can use the Parallax feature to improve your website design. You are free to use it the way you want. Nevertheless, here are some use examples that you may find useful. The Parallax effect can be used for your website header for example. The Parallax feature may help you give an impression of both modernity and fluidity to your website as soon as your visitors arrive at your homepage. This could even have a positive impact on your bounce rate! If you want to highlight the information contained in your footer or give it an original look. Once again, you will be able to take advantage of the parallax feature by inserting a beautiful image (in full width) with a 3D effect at the bottom of your background page. 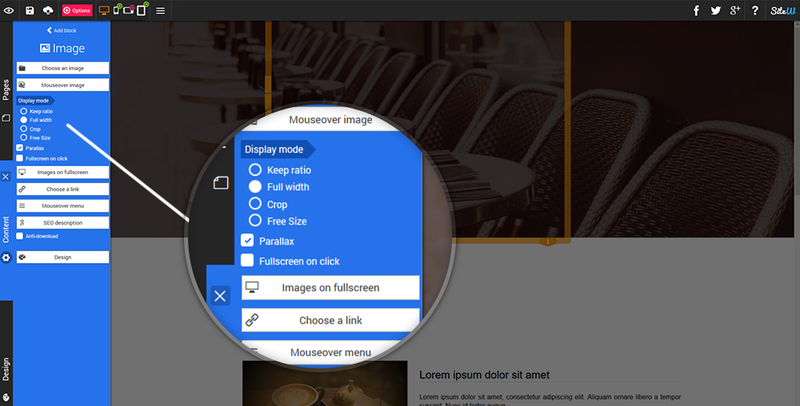 Finally, you can also use the Parallax effect as a content separator for your webpage. This is an original, elegant and modern way to distinguish 2 sections or 2 paragraphs of your website. You now know how to enable and above all how to take advantage of this new design tool. Now, just relax.. And parallax! Don’t hesitate to share your web creations with us!